Bouldering isn’t the oldest form of climbing, but it may be the most modern. It doesn’t require tall walls or obscure knots, and it’s fun in groups. Especially in cities, bouldering is the most common form of indoor climbing. It’s a great way to train, learn, or just have a good time. Even so, bouldering requires some know-how to get the most out of the experience. To help out, we put together a complete guide to starting your bouldering career. If you’re just diving into the wide world of bouldering, this is what you need to know. Bouldering refers to climbs that are protected by pads rather than ropes. Generally, that means that bouldering doesn’t take you too high off the ground — most boulder “problems” aren’t more than 12 or 15 feet tall. Most outdoor problems are located on large boulders (surprise), but some may be on low cliffs. Like many genres of climbing, this definition can get blurry. 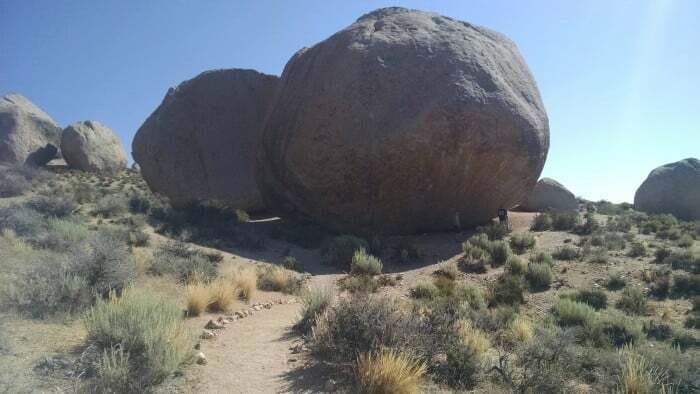 Some boulder problems are much longer than 15 feet, but because they stay close to the ground they’re still protected by pads. These climbs may resemble sport routes more than traditional boulder problems, but they’re still categorized as boulders. Other times, a tall boulder will have bolts and be categorized as a sport climb. Extremely tall problems blur the line between bouldering and free soloing (climbing tall walls without a rope). Past a certain point, pads can only help so much. In general, however, boulder problems are relatively short sequences that prioritize power and technique over long-term endurance. That doesn’t mean bouldering is any less difficult — boulder problems will still leave you gasping for air. And just like longer routes, boulder problems have various levels of difficulty. Climbing grades are a polarizing topic in the community, and I encourage beginner boulderers not to put too much stock in them. Grades are a loose way for climbers to communicate with each other about how difficult problems are. Emphasis is on loose — grades are helpful, but they resist consensus and vary widely (especially indoors). The two most common systems for grading boulder problems are the Hueco system (commonly known as the “V Scale”) and the Fontainebleau system (aka the “Font Scale”). Here’s a map showing which countries most commonly use which bouldering scale. In North America and Oceania you’ll usually see the V Scale. It begins at V0 and counts up: V1, V2, V3…and so on. Even V0 problems can be demanding — if you’re coming from route grades, a V0 problem can have moves as hard as a 5.10 climb. Some introductory problems will bear a “VB” grade, which means the problem is easier than V0. In the first months of bouldering, most climbers learn on problems in the V0-V2 range. Moving up grades becomes difficult in a hurry, and breaking into double digits is the sign of an elite climber. The upper end of the scale is open-ended. The hardest boulder problem in the world is currently Nalle Hukkataival’s opus, Burden of Dreams, which is the only problem so far to receive a proposed grade of V17. In Europe and Asia you’ll usually see the Font Scale. It starts at 1 and is open-ended like the V Scale, though problems with grades lower than 3 are rare. Unlike the V Scale, once the Font Scale gets to 6 letters are appended to each number, but only from A to C. Pluses are also added to further subdivide grades. A 6A+ is harder than a 6A, for example. Font grades can be roughly translated to V grades and vice versa. Burden of Dreams, the V17 boulder mentioned above, is a 9A on the Font Scale. If you’d like more background on the various climbing and bouldering grading systems, check out our complete guides to bouldering grades and climbing grades. It’s nice to understand a little bit about what gives bouldering its identity, and where it came from. Exact history is hard to pin down, but short problems were likely used as training as early as the 19th century. In the latter half of the century, climbers in Great Britain’s Lake District and the French forest of Fontainebleau were establishing problems at what would become some of the world’s oldest bouldering areas. In the early 20th century, Fontainebleau became a center for bouldering innovation. Specialized climbing shoes, rugs placed as protection, and basic dynamic moves are often traced back to Pierre Allain, one of the “Bleausards.” Fontainebleau is the first area in the world where bouldering was recognized for its own sake, rather than as a training device for larger objectives. The story of modern American bouldering begins with a mathematician named John Gill. Gill was an ex-gymnast, and in the 1950s he brought several lessons to his new sport. He used chalk to absorb moisture, used specific strength training to improve, and advocated for bouldering as its own climbing discipline. He also brought a gymnast’s affinity for grading difficulty — the earliest American grading system was proposed by Gill himself, a simple rating of B1, B2, or B3. It wasn’t until the latter half of the century that John “Verm” Sherman would coin the V Scale in the bouldering hotspot of Hueco Tanks, Texas. By that point bouldering was catching on: guidebooks were printed, crash pads were mass produced, and bouldering became a recognized sport. 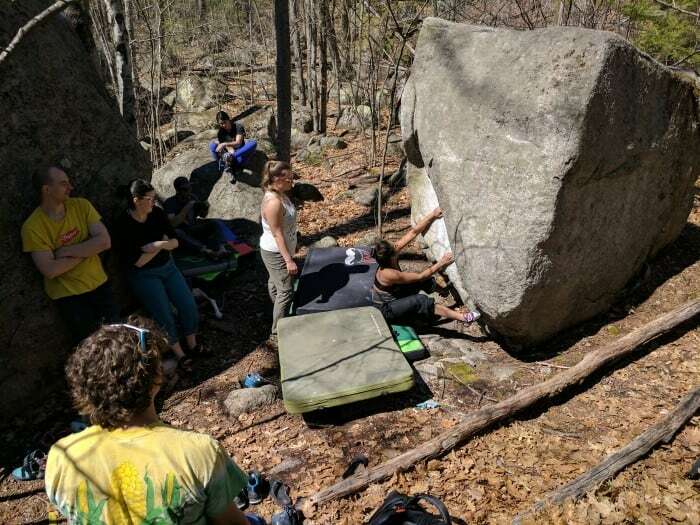 Bouldering has advanced a great deal, but it retains several core attributes: short lines, powerful and demanding sequences, and a focus on dynamic movement. Such concentrated difficulty is less common on longer routes, which is why bouldering is such an effective way to train. More than that, it makes bouldering just plain fun. On longer routes, a climber might pull the moves on their first try but need time to put all the sequences together. On a bouldering “project,” it might take multiple sessions just to stick a move, or weeks to perfect sequences. Because bouldering allows climbers to work at their limits, technique and mentality are often especially important. Some climbers dislike the focus on power and difficulty, but many prefer it above all else. If you’re curious, John Gill has some excellent reflections on bouldering’s history on his website. One of the chief virtues of bouldering is the lack of necessary equipment. All you really need to get started is a pair of beginner-friendly climbing shoes. Inside a gym, that’s all you’ll ever need. Just throw on your shoes, chalk up your hands, and start climbing — no knots, no belays, no fuss. Bouldering remains the cheapest and most accessible form of climbing. Once you’re ready to head outside (or you’ve been a few times with friends), you might consider investing in your own crash pad. Pads have come a long way since the towels and rugs of old, and you can now find portable mattresses in a variety of shapes and sizes. A crash pad is a significant investment, so get one you like — here are our favorites. Climbing gyms come in various different configurations, but you can count on a few constants at bouldering walls. Problems will be coded with color, using either colored tape or the color of the holds themselves. To climb a problem, use only holds belonging to that color. Starting holds are usually marked in some obvious way — an extra piece of tape, a colored box, or a card with the grade on it. Start with your hands on the starting hold(s), and climb to the top of the wall. Most gyms will also mark a finishing hold, either at the top of the wall or close to it. A few gyms have areas where climbers can “top out,” which means climbing all the way on top of a formation (more on all the bouldering lingo later). Where topping out is possible, an easy descent route, like stairs or a ladder, will exist somewhere else on the formation. If you’re bouldering outside, a little more thinking is involved. There’s no tape or color-coding, so you’ll have to find your hand- and footholds for yourself (although most handholds are covered in chalk). Starting holds are a matter of convention, but you’ll need to consult Mountain Project or a guidebook to find out what they are. Outdoors, almost every problem requires a top out of some form. Beware — topping out can be the most stressful part of a climb. You might not be too far off the ground, but that doesn’t mean bouldering is without risk. In fact, because every fall means hitting the ground, some types of injury (like broken wrists or ankles) are more likely than on roped climbs. To keep falls safe, stay aware. Make sure that nothing is on the pads below the problem you intend to climb: no water bottles, nothing to twist an ankle on, and especially no other climbers. Falling safely is a skill unto itself, and it takes a little practice. When you do fall, don’t try to catch other holds or slow yourself down. Instead, learn to go with the flow: accept the fall, stay engaged (but not stiff), and prepare for the landing. When possible, absorb shock with your knees first. Land with your feet flat and your knees bent and soft. Allow the knees to collapse and continue your fall, rolling onto your back (or your side, if necessary). As counterintuitive as it may seem, stay a little relaxed on the landing — stiff limbs are prone to injury. Never land with your arms out or absorb impact with your wrists. Learn to bring your arms in when you fall, keeping them out of the way of the impact. Don’t try to stick the landing, either. It might be easy from a few feet up, but from the top of the wall it’s much safer to roll. On big falls, tucking your chin can help avoid whiplash. Bouldering will put you in challenging positions — upside down, sideways, you name it. Every fall is different, and it’s worth thinking about how you might land if you fell from various different moves. The same concepts will almost always apply: go with the fall, stay relaxed but engaged, and don’t absorb shock with your arms. Outdoors, clever pad placement is a key to safety. Now that you’re ready to climb, you’ll need to learn to communicate with your fellow climbers. Like all forms of climbing, bouldering has its own jargon. Beta (n.): Advice or insight regarding the best way to execute a move or sequence. Campus (v.): To climb without using your feet. Crux (n.): The hardest sequence of moves in a problem. Deadpoint (n. or v.): A long dynamic move with one hand, or the act of completing such a move. Dyno (n. or v.): A move requiring that both hands (and sometimes both feet) leave the wall in a long jump to the next hold, or the act of completing such a move. Flash (n. or v.): To climb a problem on your first try after having received information or seen someone climb it, or a successful attempt at doing so. Highball (adj. or n.): Describes a boulder problem tall enough that a fall from the top risks serious injury. Onsight (n. or v.): To climb a problem on your first try with no information about how to climb it, or a successful attempt at doing so. Problem (n.): A sequence of holds with a start point and end point. Project (n. or v.): A problem that a climber attempts many times while learning, or the act of doing so. Send (v.): To climb a problem without falling. Soft (adj. ): Easier than the advertised grade. Spot (v.): To guide another climber’s fall for safety. Spray (v.): To offer beta to another climber (esp. when unprompted). Stiff (adj. ): Harder than the advertised grade. Top Out (n. or v.): To climb until you can stand on top of a formation, or the moves allowing you to do so. Traverse (n. or v.): To move laterally across the wall, or a climb consisting mostly of lateral movement. All this jargon can weave together in ways that are oftentimes difficult for beginner boulderers to follow. For example: In the following clip, a climber performs a dyno, a move which may have been the crux of that problem. Don’t stress if you get confused by the lingo. There’s no shame in asking a fellow climber to explain the terms they’re using. Let’s zoom in on one of those terms: spotting. Spotting requires standing below a climber while they move, ready to guide their fall should it be necessary. A spotter can help prevent climbers from landing on unsafe terrain or from falling in a position likely to cause injury. Indoors, spotting is often unnecessary. When pads blanket every surface, it can be safer to let a climber prepare for the fall on their own. Spotting might still be advisable in certain positions: with a high heel-hook, for example, a climber might be likely to fall head-first. In cases like this, a spotter can help ensure that the climber doesn’t land on their head or neck. Outdoors, spotting becomes more important. Pads can only cover so much space and often leave gaps. Spotters can help guide a fall to make sure the climber lands safely on padded terrain. Just like falling, spotting is its own skill. A spotter’s job is not to catch the climber — just to make sure that their fall is safe. Learn from experienced spotters before trying it on your own, but don’t be shy about asking for a spot if you need one! No two boulder problems are alike, but a few common features help classify climbs. Arêtes and Compression: Climbing protruding fins and blocks often requires “hugging” or “slapping” up on various holds. You’ll often have to do it with your feet, too! Circus Tricks: Competition climbing has popularized various forms of unique movement. You won’t find many running traverses or jump starts outside, but you can expect to find a few at most gyms. Cracks: Mostly found outdoors, crack problems can involve specialized crack-climbing techniques. Overhangs: Tipped past 90 degrees, boulder problems put progressively more weight on the arms. Expect big moves, clean falls, and lots of technique to learn. Roofs: the extreme form of overhangs, roofs involve some distance of horizontal climbing. Holds tend to be bigger, but moves are often gymnastic and strength-intensive. Toe-hooks and heel-hooks are common, as is a burning sensation in the arms. Slabs: less-than-vertical boulder problems are the domain of delicate balance and tiny crimps. Slabs will get your body awareness in shape in a hurry. Traverses: Long traverses are the most endurance-heavy problems in bouldering. Most gyms set at least one, but quality traverse problems also exist outdoors. Vertical: In between slabs and overhangs, vertical terrain requires good footwork and strong fingers. You may find that you gravitate toward some categories more than others. Make sure to work on your weaknesses, too! Share the wall. When you’re the only one around, it’s fine to monopolize some real estate. But when there’s a crowd, make sure that you get out of the way after you fall. There’s a natural rhythm to taking turns, and it helps to have a break anyway. If the climb you want to do overlaps with other climbs, don’t begin until the other climbs are clear, too. Avoid giving other climbers beta unless you know they want it. Many climbers enjoy the process of figuring out climbs on their own. If you’re unsure, just ask the climber if they want beta or not. On the flipside, DO make sure to chat with other boulderers. Bouldering can be the most social form of climbing — make friends! Keep your belongings in check. When you’re in the gym, don’t leave your water bottle on the pads. When you’re outside, don’t spread your kit below the whole boulder. If someone has just brushed the holds on a problem, give them first dibs on the next attempt. If you’re about to try a move with wild swings or falls (like a horizontal dyno), consider notifying nearby climbers to avoid accidents. If your gym has movable pads, ask nearby climbers if they’re using a pad before you move it. If you accidentally disturb a route in the gym (by rotating a hold, scraping off tape, etc. ), let the gym staff know so they can fix it. Leave no trace applies to bouldering too. No one wants to find your crushed celebration-beer can when they head out for a day at the boulders. Outside, it’s common for climbers to mark hand- or footholds with lines or dots of chalk. That’s fine, but make sure to brush them off when you leave so that other climbers can discover the subtleties for themselves. Be judicious about music and noise. If you’re in the gym, make sure that your headphones aren’t so loud that you can’t hear warnings from other climbers. If you’re outside, consider your surroundings before blasting the Beastie Boys on your boombox. Don’t squash the stoke. If someone needs help or advice, do your best to help out. If a climber just sent their project, don’t start yammering about how easy it was for you. Be kind and supportive, and others will be too. When in doubt, ask! Boulderers tend to be welcoming, and most are more than happy to help you learn. Be sure to erase your ticks! That’s a lot to keep in mind, but as always, the number one rule is to enjoy the process. Compared to other climbing disciplines, bouldering has a reputation for being hard. That’s not a bad thing, but remember to have some fun, too. The moves may be difficult, but the company is good, the rewards are many, and the rocks are waiting.